Each year, I always look forward to the season change from winter to spring, however, as flu season fades, a new kind of epidemic creeps into urgent care and family medicine offices across the U.S: allergy season. Allergic rhinitis is commonly misunderstood by the general public and may result in office visits requesting antibiotics, steroids, or other measures to improve symptoms. Spending the extra few minutes with patients to help them understand the cause, symptoms, and treatment of allergic rhinitis will help improve patient understanding and avoid unnecessary prescriptions. Allergic rhinitis is a reaction to an allergen which causes a specific set of symptoms. Usually this is IgE mediated and the response involves mucous membranes of the nasal passages, oral mucosa, and ears. Allergic rhinitis itself can be divided into categories based on the timing of symptoms. In patients with constant, yearlong symptoms from occupational or other exposure, one would classify this as perennial. Perennial may be associated with indoor allergens from dust mites, cockroaches, animal dander, or mold. In other patients who have episodic or sporadic trouble, the term to describe best is seasonal allergic rhinitis. Classically, tree pollen, shrubs are active in spring, grasses and other flowering plants in the summer, and ragweed and mold are found in the fall. Allergic rhinitis and allergy symptoms are extremely common. It is estimated that up to 25% of the population has some form of the condition, depending on the climate, location, and time of year. Patients with chronic allergic rhinitis usually have an onset in childhood, but a peak is noted within the first few decades of life. The allergic response is a cascade of many different inflammatory markers. When an allergen is presented, there is a responding mucosal inflammation which results in the many symptoms of allergic rhinitis. A full review of the pathophysiology of allergic rhinitis, inflammatory markers, and biochemical markers should be reviewed elsewhere. Risk factors for allergic rhinitis include a previous history of atopic dermatitis, tobacco use or exposure, concomitant asthma, new climate, new environmental allergens, dry climate, and pet exposure. Prevention is obviously a very important tool to managing the condition. There is evidence that breast feeding lowers incidence of atopic dermatitis and other allergies. One of the recommended first line treatments and prevention is allergen avoidance. Patients should be encouraged to be pro-active about their symptoms in preparation for a new season with different allergens. Air conditioning and avoiding being outside during peak time of day can be helpful. A dehumidifier at home can reduce humidity (Rafiq, 2016). The diagnosis is largely clinical. There is very rarely any indication for lab work or imaging in relation to diagnosis. The history should elucidate the timing, duration, severity, and time of season. History of atopic dermatitis or other previous allergies should be documented. Family history, social history, occupation are all important. New environmental stimuli such as a new season, new work environment, new pet should be questioned. The examination in allergic rhinitis is complimentary to the history. Dark circles noted under the eye or “allergic shiners” can be seen. Rhinorrhea, usually clear in nature is observed in many patients. Boggy or pale nasal mucosa is common as well as post nasal drip. Patients may complain of rhinorrhea, sinus congestion, drainage, sore throat, cough, ear pressure, and ear pain. Many patients will be concerned about strep throat, bacterial sinusitis, otitis media and may indicate their request/need for an antibiotic. As discussed above, the treatment for allergic rhinitis largely is related to allergen avoidance. There is no indication for antibiotics in the acute setting unless there are other signs of bacterial infection. Identifying the offending agent and using behavioral avoidance is very helpful. Staying indoors during allergy season, switching jobs, or removing an offending agent from the home can be curative. The first line treatment for allergic rhinitis is a 2nd generation, non-sedation oral antihistamine. These are cost effective and available over the counter. Examples include cetirizine, levocetirizine, fexofenadine, and loratidine. These may cause mild sedation, but are less sedating than the 1st generation antihistamines. Another reasonable option includes intranasal corticosteroids such as fluticasone or Nasocort. Nasal decongestants such as phenylephrine, pseudoephedrine, and oxymetazoline are commonly used by the general public and may provide a short course of symptomatic relief. Patients should be educated on the risk for rebound rhinitis and discouraged to use more than three days consecutively. Patients with hypertension or cardiac disease should also avoid their use. The leukotriene antagonist singulair is a good adjunct to over the counter therapy if there is minimal relief with antihistamines. Dosed in the evening, this medication works on leukotrienes to help with refractory symptoms, but should not be used as monotherapy. For patients with refractory symptoms despite all of the above, a referral on to an ENT specialist or immunologist for formal allergy testing may be useful. RAST testing via skin exposure is a way to determine what the patient is allergic to. 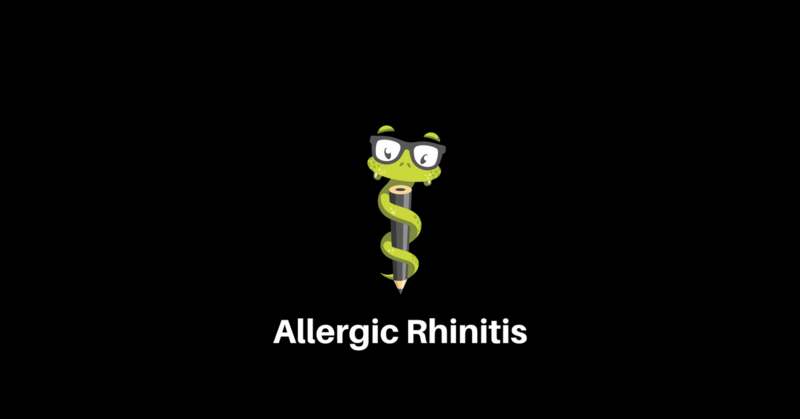 In summary, allergic rhinitis is a commonly encountered diagnosis depending on climate and exposure. Many patients require education regarding the symptoms, avoidance, and vastly supportive therapy. Min, Yang, (2010). The Pathophysiology, Diagnosis, and Treatment of Allergic Rhinitis. Allergy Asthma Immunology Res. 2(2): 65-76. Rafiq, Naureen (2016) Rhinitis, Allergic. The 5 Minute Clinical Consult. Wolters Kluwer.